154.9 kg. , 341.5 lbs. The conditions were cloudy, windy, and undesirable to say the least. Apart from that, we weren’t off to a good start; our alarm clocks were out by an hour thanks to an automatic time change on the iPhone, and the end of daylight savings in New South Wales. By the time we made it to the boat ramp, first light was well and truly up as we launched ‘the Predator’, captained by Ryan Pauline. The rolling seas didn’t make the search easy, but by midday we found the bait ball, approximately 18 miles out to sea in 100m of water. It was so rough that we couldn’t trust the bird life to point us in the right direction, only the keen eyes of our skipper. The bubbling surface and the shadow of a seal a few metres below got our hearts racing… and there she was. 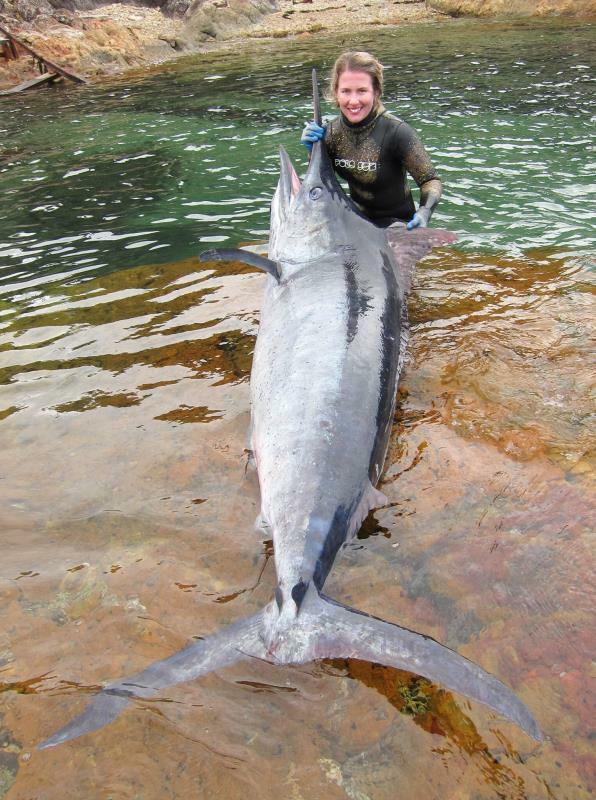 A large black marlin had begun to take interest in the ball full of slimey mackerel. As I waited patiently to jump in, Ryan positioned me up wind of the swell. Bryson Sheehy, my dive buddy, was ready at the stern with camera in hand, whilst deck hand Rod Skinner kept my float line set. It was go time. Bryson jumped in seconds before I did, and begun to film the ball. I jumped in, checked my slip tip was secure, and had about five seconds to take a breath, duck dive, and level out in time to take a shot. I was only a few metres deep when I took my last kick towards the fish, just in time for it to turn broad side and give me a good opportunity to pull the trigger. I was able to manoeuvre my inverted roller spear gun around so quick, thankfully, due to its short length and light weight. The spear entered the fish right behind the pectoral fins; at this stage I wasn’t sure how far through the slip tip had engaged. The fish took off past the ball and seal, completely out of sight within moments. After about 50 minutes of playing the fish and shortening the rig line onto my Tommy Botha float, the fish was sitting at about 15m deep. I could just make out the shape from the surface, and knew it was ready for a second kill shot. I grabbed my reel gun, loaded it up, and dived to the fish. I shot the marlin in the brain; it was then I noticed the first securing shot had toggled neatly all the way through the fish! As I returned to the surface, I took a big breath and started to pull it up. For every pull, I’d sink just as far! I had to adapt my style quickly if I was going to get this fish up. By kicking and pulling hard each time, I was successful in making the ground I needed. After I got it to the surface, my anxiety faded and excitement grew; I’d landed THE fish of a lifetime. I gazed upon it’s luminescent skin, the number of parasites over it’s body, and felt the roughness of it’s bill, even through my gloves. I couldn’t believe my eyes. It was so big I needed to use my entire body to pull it around, and swim it to the boat. In no time Ryan and Bryson had alerted me to my surrounds – we had company. A firm notation to get in the boat meant I had to be hasty.